High thermal conductivity of amorphous silicon - a quantum mechanics size effect? One such heat transfer mechanism at the nanoscale that avoids phonons is the theory of QED induced EM radiation. QED stands for quantum electrodynamics and EM for electromagnetic. 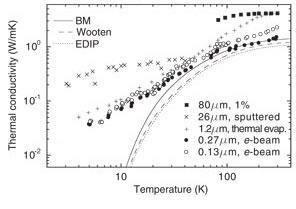 By this theory, absorbed EM is promptly conserved by the QED induced creation of photons within the nanostructure that then are emitted to the surroundings as non-thermal QED radiation at UV or higher levels. What makes this possible is that quantum mechanics requires the specific heat of atoms at the nanoscale to vanish. See http://www.nanoqed.org at “Nanofluids and Thin Films”, 2009. 1. Contrary to expectations, the thermal conductivity of the 80 micron sample appears higher than that of the submicron samples because of the size effect of quantum mechanics.